The ancient and mysterious Roman Empire is of great interest to many people. When travelling through the Middle East, Northern Africa and Europe, including the United Kingdom, there is evidence of the historical civilization everywhere. On our recent trip to the United Kingdom, we had planned to visit Hadrian’s Wall, which is fairly well preserved, well known and frequented by many tourists. In addition, there are other areas of England where there is evidence of Roman settlement. One example is the city of Bath, which has very well preserved and extensive Roman baths. We wondered during our travels why didn’t the Romans go beyond Hadrian’s wall into what is now Scotland. A little bit of searching revealed that indeed, the Romans did go into Scotland but only for a 20 year period. It was interesting to discover that apparently, the Romans couldn’t cope with the Scottish tribes. 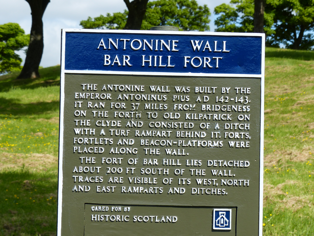 To keep them out the Romans even built a wall, Antonine’s wall, named after the emperor Antoninus. We decided to try and find it! From what we had read, the wall was much more obscure than Hadrian’s Wall and was not very well signposted. So from Edinburgh we drove towards the town of Cumbernauld and onto the village of Twechar. It was there that we came to a little sign pointing right to Antonine’s wall. The sign itself was confusing with three arrows giving conflicting directions. We drove up one of the options, a gravel road only to find that it was blocked by a locked gate. We then decided to walk as the sign had said 400 metres to the wall. Walking uphill, it led us to an empty field with some cows but no indication of any wall. We walked another several hundred metres and still, there was nothing to be seen. The path was circling around back down hill, so we felt there was nowhere to go forward. We then decided to head back but we were still determined to find this wall which was obviously, hidden from view. Walking back about 100 metres we came to a track on the right and further up was a metal gate with a little red sign on it. Before giving up we went to check it out. As we approached, we could make out “Antonine’s Wall” and “Bar Hill Fort” with an arrow pointing straight ahead. Just beyond that was a grouping of stones which was a remnant of an ancient Roman fort. Beyond that we could make out the wall which was mostly covered with turf. There really wasn’t much to the wall as it had probably been pillaged over the centuries however, we felt a great deal of accomplishment having found it! The interesting thing about being there was that there was absolutely no one else around. We felt as if we were discoverers on a secret mission. One of the things that we like to do is look for obscure geographical or historical places so we felt like we had struck gold. We were also surprised to find that very few people in Scotland even knew that the wall was there. So it really was like our own little Scottish Treasure Hunt! 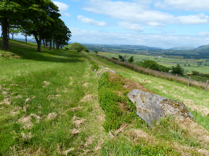 Have you been to Antonine’s Wall in Scotland or is there a secret tourist destination that you have found in your travels?